Caption: Aplysina lacunosa 3 to 5 feet long, some considerably larger. Large clusters with 10 or more tubes can be more than 6 feet across. Outer surface covered with wart-like bumps. They are typically found from depths of 40-80 feet deep, protruding from the coral wall face. 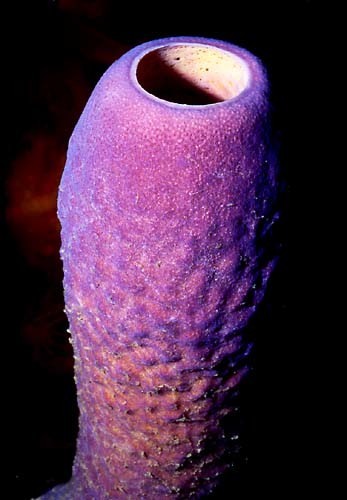 The Tube Sponge is one of the most common varieties of sponge to be found on the reef. It is distinguished by its long tube-shaped growths, and ranges in color from purple to blue, gray, and gray-green. Filtered water is ejected through the large openings on the ends. This is one of the few reef invertebrates that is blue in color..